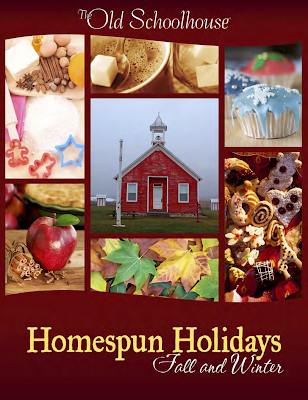 The Old Schoolhouse Magazine sent me a copy of their “Homespun Holidays: Fall and Winter” ebook to check out for you guys as part of the Schoolhouse Review Crew! I was really excited to share this particular ebook with you because I know that you guys are always looking for fun ideas for the holidays with your kiddos. Set up with reader contributions, this book reads a little like a Pinterest board, but without all the clicking. Fall includes funny poems, book recommendations for you to read with your children, craft ideas for scarecrows, front porch decorations, etc, and a bunch of tasty recipes. Winter includes an idea for a “Night Before” party, car bingo, paper angels and snowflakes, ideas for recycling all those Christmas cards, and additional tasty recipes. What I like about the ebook format, as opposed to Pinterest, is that you don’t get sucked into a death spiral of pinning. The ideas are already selected for you, so you can’t just pin one more thing (instead of spending time actually making something!). 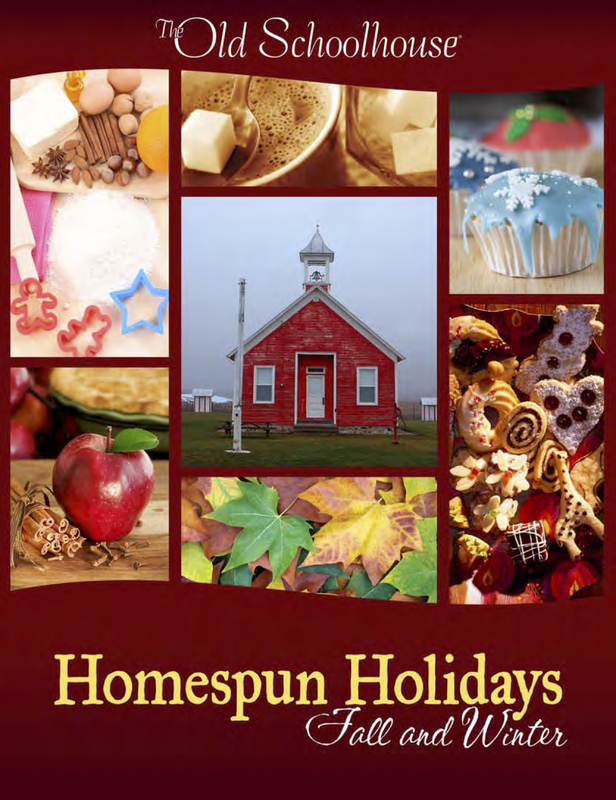 I also enjoyed the sweet stories from readers who included their holiday traditions. I know that we have several readers who are military and can’t always be with their own families during the holidays, so being able to develop your own special traditions, whether it’s a family leaf-raking or a special tree decoration, could be vital to keeping the holidays special when you can’t be with the special people you love. By the time I had a moment to read this, we’d actually had our Thanksgiving/Fall decorations up for some time, so I bypassed the decorating section altogether, although there are some cute ideas. However, we were able to pick up the two books recommended to read with your children and especially enjoyed the illustrations in the book by Vera Kay. It is so overwhelming to try to pick holiday books- there are just a plethora and I want to know what’s going to be quality, so I really appreciated these! Next, I moved on to a recipe. My brother-in-law is a Hare Krishna Monk (yes, this is related) and recently came to visit us and brought a GIANT bag of pecans from Texas, where he’d been just a few weeks before. 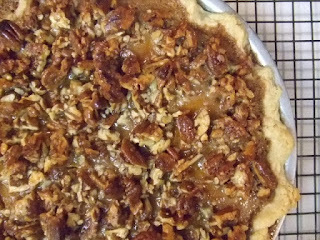 My kids have actually had a blast shelling pecans over the last week, so we decided that we’d try out the recipe for pecan pie with our hard-won goods! In the Winter section, I was a little bummed there wasn’t a printable car bingo card. We have a few car trips coming up to various hockey tournaments and it would have been nice to just print the page out without having to make my own boards, but I still like the idea. 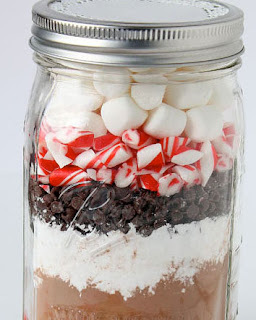 We went to the recipe section again for something quick to try, and ended up going with the hot cocoa jars because we had all the ingredients on hand. My older son is excited to try the paper snowflakes, but he’s waiting for a friend to come over. I like that some of the crafts have very detailed instructions so that children who are older (like my almost-12-year-old) can feel confident following them on their own. If you’re looking for a fun compilation of holiday crafts that’s ready-to-go without a lot of searching, give this a try! It’s a nice grouping of simple, easy-to-follow ideas that you can do easily with your children. If you’re looking for high-end crafts, this isn’t it, but it is simple, fun ideas your family will enjoy. Disclosure: I was provided with a free copy of this ebook to perform my review. All opinions are my own.